PUNE: Pune has notched up another distinction: The total number of vehicles here has surpassed the human population, considered a first for any urban area in the country, officials said. "Till March 31, 2018, the RTO has notched an increase of over 280,000 vehicles, with two-wheelers still enjoying the lion's share. 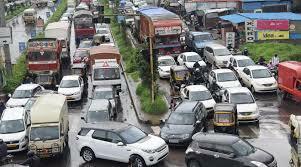 This takes the figure of registered vehicles in the city to 36.27 lakh, from 33.37 lakh the previous year (2016-2017)," Ajri told pune-news.com. Compared with 2017, the number of four-wheelers registered increased from 5.89 lakh to 6.45 lakh in 2018 and the number of registered two-wheelers shot up from 24.97 lakh to 27.03 lakh now, he added. By implication, this denotes at least one vehicle owned per family in the city, and in many cases, a combination of either a four-wheeler and two-wheeler, or multiple two-wheelers. In percentage terms, the registration of four wheelers in 2018 notched a growth of 9.57 per cent and two-wheelers by 8.24 per cent over 2017. Consequently, Ajri said, that Pune RTO's revenues overshot the target of Rs 862.32 crore by 118.38 per cent to net Rs 1,021.56 crore. "We had overshot the target even in 2017 by 130.31 per cent, netting Rs 783.93 crore, with a growth of Rs 237.63 crore then," Ajri said. In 2018, the highest growth of 25 per cent was seen in the taxi-cab segment with a total of 28,344 cabs registered against 22,696 in 2016-2017. Ajri attributed this growth to the increased acceptance of cabs as a mode of conveyance over self-owned or self-driven vehicles by the growing industrial, IT, educational sectors, and upcoming residential complexes in and around Pune, among others.